This book was on my 2012 reading list. And I read it! Now what?! I almost loved this book. Really. It is funny and clever. 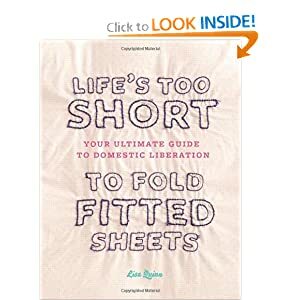 It has lots of great housekeeping, decorating, and entertaining tips. Then she added some recipes. Her week night recipes were all pretty awful. I can’t imagine serving some of those things to my family. No, thank you. Her entertaining recipes and short cut tips are far from short cuts! Her “easy” pantry list is miles long and so complicated. Caviar as a pantry staple? Really? You’re gonna stand by that one? Her cheats for entertaining were way more than I ever do or would even consider. Her ideas for catering events are much more complicated than my from scratch home cooked meal. I’d hate to see her before she embraced the “good enough” life. I actually would recommend reading it. It is amusing. Now, if you’re the type that will feel compelled to actually listen to here, then maybe you shouldn’t read it. If you want to read it for funsies, go right ahead. Just don’t take her too seriously. Real people don’t live like her, really.